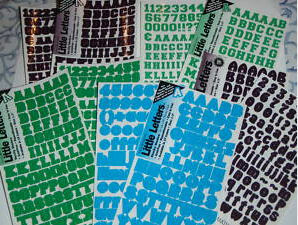 Alphabet stickers don’t have to be stiff or simply educational. Alphabet wall decals are a fun way to introduce your kids to the ABCs very early! How large or small or whether you prefer upper or lower case stickers on the wall for decorations is entirely up to you but for educational purposes, you might want to focus on capital letters to start. Regardless of your taste in alphabet nursery decor, it's a fact that alphabet wall decals are one of the least expensive wall decorations that you will find (other than paint of course )and that they are cheap is not the only thing to love. For those that do not mind a more permanent type of wall decor, stenciling the letters is a very popular and inexpensive option. Go here to see more alphabet stickers and decor for a child's room. The letters can be arranged to spell your baby’s name over the crib. You can use wall decals to spell out a word when the little ones are old enough to start learning to read or you can remove them when your children know their ABCs backwards and forwards without any problem. The removable alphabet wall decals should leave no sticky residual or damage to the paint when time comes to give the bedroom a makeover or when you move out of your rented apartment and into your new home! Parents who are living in a rented apartment don’t have to worry about losing their damage deposit because damage that nail holes left in the bedroom walls! Alphabet wall decals generally come in a set that is either a wide variety of primary colors or you can have them custom made to match practically any and all nursery bedding sets. After decorating many gender neutral baby nurseries in an Alphabet nursery theme, my favorite use for ABC stickers is to use them to spell out the baby’s name when hanging wooden letters over the baby bed is not possible. When you either move or the time comes to put away the baby's bed and bring in the toddler bed you may be able to use stickers as part of the room decorations for a several years before it’s time to retire them altogether as they are so easily adapted to many butterfly nursery designs, bedroom themes and color schemes. If you have a picture of a baby's nursery or a child's room that has been decorated using the letters of the alphabet, please send them in! Please use the form on this page that I have provided to make it easy to upload your photos so that it will not take but a minute to share your ideas with other mothers-to-be that visit Unique Baby Gear Ideas.